Owing to Professor Wanqin Jin’s invitation, Vise Professor Jianwen Jiang from National University of Singapore visited our laboratory for the first time, then delivered a wonderful report to our teachers and students in Key Laboratory Lecture Hall A506. The report was titles as ‘Molecular Insights into Energy, Environmental and Pharmaceutical Applications in Metal-Organic Frameworks’. 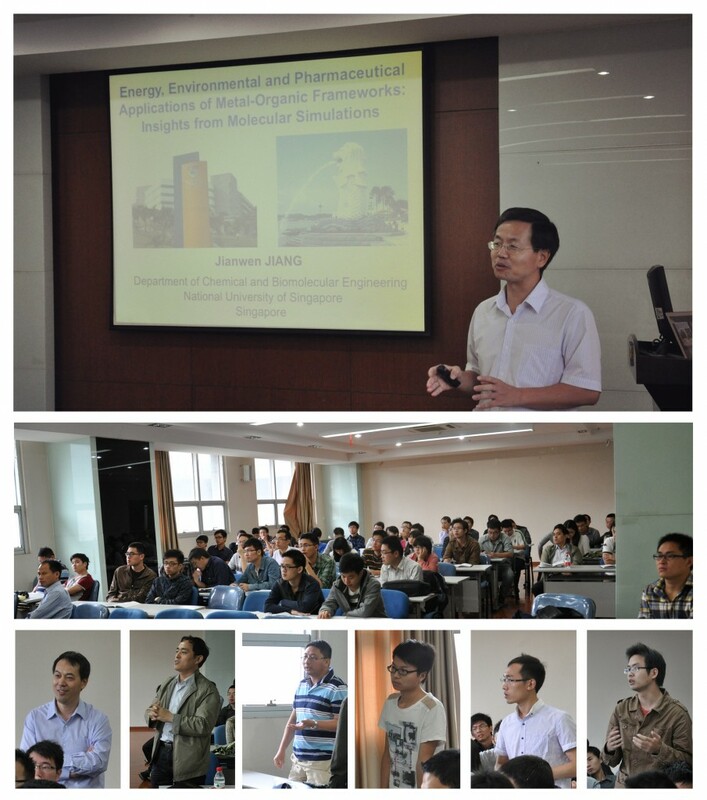 Professor Jianwen Jiang’s report mainly covered the application of MOFs(Metal-Organic Frameworks) in gas and liquid phase, including CO2 adsorption, H2O purification and drug delivery. He also introduced differences on the topological structure, hole size and pore group of different MOFs materials in terms of molecular simulation. When he introduced the adsorption application of MOFs materials for CO2, he mainly put forward bottom-up strategies, functionalized MOFs and Ionic MOFs to improve and strengthen MOFs structure in order to increase the adsorption for CO2. Besides, he presented the prediction of MOFs material performance with molecular simulation and the importance of skeleton structure design because theory simulation will be used to direct our experiment and to help us optimize the most reasonable experimental scheme. Teachers and students present posed questions relevant to their own research subject to Professor Jiang at the end of report. He answered those questions patiently and actively. Professor Jiang’s report aroused everyone’s interest and won cheers of applause.